This article, introduced by George Nielsen and written by Pat Larsen, first appeared in the July 2016 Newsletter of the Texas Wendish Heritage Society, Serbin, Texas. One aspect of Wendish life that is generally ignored in Wendish studies is the daily activity of making a living. While most Wends took up farming, there were also some who became craftsmen. One of the craftsmen was Andrew Urban. A descendant of his, Patricia Swayze Larsen, has examined his life and his contribution to the community. Patricia spent her early childhood in Thorndale but then, as a student and later spouse of Brig. Gen. Philip N. Larsen, she lived in San Antonio and the Washington, D. C. area. She is an ardent family historian and is well versed in her Wendish heritage. If you have an ancestor who impressed you with his approach to making a living, please write about that person and share your information with us. George Nielsen. This article by George Nielsen first appeared in the October 2016 Newsletter of the Texas Wendish Heritage Society. Helping fellow members of the faith has a long history with the Texas Wends. Both German and Wendish newspaper articles that reported the departure of the 1854 migration from the Bautzen train station also stated that the poorer immigrants received financial support from those who were well to do. And both articles mentioned that the poor people would repay their benefactors when they arrived in their new country. Unfortunately, there are no documents that spell out the details of this support and any attempt to piece together the program from scattered incidental comments, could very well raise more questions than it answers. While we do know that the support was limited to the cost of the ticket, which was 55 Taler, we do not know how many poor people received support. One source states that the amount in the fund was 8,000 Taler, which would cover 145 tickets, and another source says it was 6,000, which would pay for 109 tickets. So a safe estimate would place the number of Wends who received assistance at slightly over one hundred. That mechanism for transferring the money from the haves to the have-nots could have been the V. L. Meyer shipping company. When individual passengers or a family unit boarded the train at Bautzen they took with them only personal items and shipped the bulky possessions separately. Because the shipping company provided the transportation, food, and other costs, the emigrant did not carry cash, but turned over all the Taler to the shipping company. The shipping firm exchanged the Talers for Dollars in Hamburg and later returned a portion to the appropriate person on arrival in Texas. The value of the fund administered by the shipping company in Hamburg was 12,000 US dollars. It is possible that the account of the emigration society held by the shipping company included the six thousand Taler for the poor as well as the Taler the emigrants deposited for exchange and later distribution. One Taler and 12 Neugroschen was the equivalent to one Dollar, or 100 Taler was equal to 75 Dollars. You can get an idea of the purchasing power of a Taler if you remember that the lay leaders promised Pastor Kilian a salary of 1,000 Taler plus fees. So in Texas terms his annual salary was 750 Dollars. In purchasing power that amount could pay for 750 acres of Delaplain League land. One problem with this program of aiding the poor was the possible death of a recipient. If a person died, who would pay the treasury for the 55 Taler investment? Kilian wrote that about 2,000 Taler was lost because of the death of the poor. At the cost of 55 Taler a person, about thirty-six of the seventy-four who died on the journey were poor. This 2,000 Taler loss presumably was pro-rated and when the American dollars were distributed, everyone received a lesser amount. The account held by the shipping company was closed on August 8, 1855, when J. W. Jockusch of Galveston, consul for both Prussia and Hamburg, sent a bill of exchange for $123.42 to H. Ernst Knolle of Industry. Knolle, in turn, presented it to the Association of Saxon and Prussian Lutherans, who in turn gave it to Pastor Kilian for the Serbin congregation. Presumably the consul acted for the shipping company by distributing the dollars that remained. While the leaders were looking for land the poor remained in Houston looking for work. When ownership for the Delaplain was transferred to the Wendish leaders (March 21, 1855) the poor were given the option to join the Wends in Bastrop County and to set up farms on the congregation’s land. There are no records that show how many took advantage of the offer, but infrequent references suggest that not many did. Working for a daily wage may have been a more realistic choice, but the practice of making church lands available for use by the poor was made a long-standing alternative and St. Peter’s congregation also adopted the practice on its fifty acres. During the years after the settlement had been established, aiding the poor or needy was generally associated with help in housing for widows, individuals who were mentally handicapped, or families whose house was destroyed by fire. Instances such as this were relatively rare. Thanks to the widow Anna Hollass for her visits and demonstrated love; to her widowed sister, Maria Kasper, for her sympathy and demonstrated great love; to John and Anna Schulze, for their demonstrated love; to John and Maria Schelnick, for their love; to aunt Anna Domaschk for visits and love, to Ursula Matthiez for visits and love, to the widows, Maria Mitschke, Anna Schubert, and Anna Malke for visits; to Carl Lehmann, for making the coffin, and to the two grave diggers, the pallbearers, and all of the mourners. Until now we had only four accounts of the 1854 migration written by individuals who were participants. 2. A German, August Haak, also wrote an account of his experiences, which Dr. Joseph Wilson published in the Journal of the German-Texas Heritage Society and subsequently appeared in A Collection of Histories of St Paul Lutheran Church, Serbin, Texas in commemoration of the congregations 150th anniversary in 2003. 3. A third source of information was a letter written by Johann Sommer, also printed in the January 2002 issue of the TWHS Newsletter. 4. And the fouirth is a letter (Ein Brief) written by Johann Teinert many years after the actual voyage. Now, thanks to the work of Marilyn Luce Miertschin Nickelsburg we have a fifth source – an account written by Johann Kieschnick. Marilyn Nickelsburg traces her Wendish ties to the Kieschnick and Miertschin families, and has done extensive work on the Miertschin family. A fourth-generation Wend, she was born in Texas (Ft. Worth) but lived in other states – separated from Wendish connections. She married George W. Nickelsburg, a pastor who became professor of religious studies at the University of Iowa. They are now retired and reside in Washington. This article first appeared in the January 2016 edition of the Newsletter of the Texas Wendish Heritage Society. Johann Pallmer’s path into the ministry was uncertain and indirect. Johann Kilian’s, on the other hand, had been a smooth one. Kilian progressed directly from the elementary grades on to secondary school (Gymnasium), and through the university. Although an orphan, Kilian inherited the small property and used it to finance his education. Pallmer lacked the funds that could have provided him with the requisite education. Kilian became the pastor of his first church at the age of twenty-six while Pallmer became a pastor at the age of thirty-eight. When Pallmer arrived at Serbin in 1870 Kilian was sixty-one years old and a veteran of a storied ministry. Pallmer was almost forty and could claim only one year of experience as pastor. Instead, his adult years had been spent working in a number of different occupations. Pallmer was born on April 4, 1831, at Bederwitz, near Bautzen, into the family of Michael Pallmer, a Gartennahrungsbesitzer. That term indicates that the family owned a house and enough land to feed the family, but not enough for being a farmer. Another source of income was necessary. Very little documentation is available about Johann’s early life and schooling, but the records that remain indicate that he satisfied his military obligations and was released from further service in 1851. In 1848 he also began a three-year program of learning the carpentry trade and in 1851 he was declared a journeyman carpenter. He worked as a carpenter for a year in Bautzen and then on April 29, 1852, he obtained his Wanderbuch (journey book) and a recommendation from August Wildenhahn, pastor of Petrikirche in Bautzen. The physical characteristics in the Wanderbuch describe him as blond with blue-grey eyes. The book spells out all the rules a journeyman was required to follow, including a police stamp in his book whenever he traveled to a new locality. He was first released to Dresden and then traveled from 1852 to 1855 working in localities such as Magdeburg, Bautzen, Hamburg and finally Herrnhut. With the exception of Hamburg, where he spent much of his time, most places were short stays. (To see the translation of the journeyman’s book go to www.wendishresearch.org, click on Forum, and then Rev. Johann Pallmer or click on the underlined link. In February 1855 he obtained a position as overseer at the Royal Institute of Gross Hennersdorf (now incorporated into Herrnhut) and remained there for eight years until March 1, 1863. In this position he not only supervised and taught, but he utilized his carpentry skills and worked in the garden and orchard. He was then transferred to the Institute at Braunsdorf to serve as director of the Family Group where he served for about a year. From Braunsdorf he moved to Dresden to attend Friedrichstaat Seminary for teachers from July 1, 1864, to Easter 1865. He scored well on his exams—although his scores in singing and violin were somewhat lower. He took a second exam on March 5,1867, and again received good marks. Beginning at Easter, 1865 he served at an orphanage at Pirna. His review on April 20, 1867 was also a positive one. His final occupation in Europe was in 1868 as a teacher in Bautzen. In spite of his achievements, the holy ministry was beyond his reach because he did not have the necessary academic credentials. He therefore became geographically mobile, and in 1868 migrated to the United States on the steamship Holsatia. The large German-speaking population in the United States needed pastors so he enrolled in the practical seminary in St. Louis, an institution that taught the essentials of ministry. The next year, 1869, Pallmer graduated and accepted a call to serve the newly created Ebenezer congregation in Baden, now in St. Louis, Missouri. On June 24, 1870, St. Peter’s congregation in Serbin sent a call to Pallmer even before the formal separation of the congregations had taken place. The call specifically asked him to work with Wendish. In his acceptance letter (12 Aug 1870) Pallmer cautioned the congregation not to expect too much from his Wendish skills. He had been born a Wend, but since the age of eighteen his exposure to Wendish had been limited. He felt comfortable with his colloquial skill, but he had not read a Wendish book during that time and he had never attempted to teach or preach in Wendish. With God’s help, however, he fully expected to regain his skills in due time. Once he accepted the call, the first issue facing Pallmer was his installation. He handled it with tact by writing a letter to Kilian (31 Aug 1870) requesting Kilian to install him into the St. Peter ministry. It was customary for a neighboring pastor to install a new pastor and, in addition, a synodical official who also authorized Kilian to perform the rite, strengthened Pallmer’s request. In the same letter Pallmer expanded on the common goals he and Kilian shared. Pallmer’s gracious letter pleased Kilian and he consented—although Kilian informed Pallmer that Kilian’s congregation would not make the church available for the installation. Pastor Pallmer and his bride of three months arrived in Serbin in October 1870. (Pallmer’s marriage to Anna Helena Herrmann had been officiated by the C. F. W. Walther, the noted synodical leader.) Gerhard Kilian, then a student in the Seminary, reported that Palmer was viewed as “a gentle, humble, and skilled person” and that Mrs. Pallmer was a nurse and considered to be a good wife.” A new church building for St. Peter’s had not been built, so between September 20, when the new group obtained ownership of the church building built by the first St. Peter, and the time of ordination, the little church was dismantled and the material was used to build a parsonage. So the installation was performed in the new parsonage on December 11, 1870. Following Pallmer’s installation there was little contact between the two pastors for a time. Both congregations were busy building churches. St. Peter needed a church as quickly as possible and built a wooden building that they dedicated in April 1871. Kilian did not attend the dedication because Pallmer’s invitation had not come soon enough to enable Kilian to make arrangements with his own congregation. The morning service was conducted in German and Pallmer preached a Wendish sermon in the afternoon service. St. Paul had already started constructing the stone church, but the project had languished during the controversy. In 1871 the efforts were redoubled and the stone church, still currently in use, was completed before Christmas that year. The competition between the two congregations may have stimulated church construction, but it had a negative effect on the relations between the two pastors. There were occasional rubs, especially over the transfer of members and at times Pallmer wrote messages to Kilian that Kilian ignored. Kilian complained that he could see the St. Peter steeple from his house and that Pallmer had a “domineering” personality. So even though both pastors held identical views on theology, they kept a respectful distance. That distance disappeared on July 4, 1873, when Helena Pallmer died from a stroke. Her death came eleven days after the giving birth to Martin Theodore Heinrich who was born and who died on the same day—June 23, 1873. Pallmer asked Kilian to conduct the burial. Kilian did so and from then on they became intimate friends and visits between Kilian and Pallmer were open and frequent. Shortly after the death of Mrs. Pallmer, Pastor Pallmer experienced several attacks of yellow fever. He recovered and on August 20 visited Pastor Kilian and Mrs. Kilian served him a bowl of barley and hops soup. But the next day Pallmer’s fever returned and a week later Kilian also was stricken by a fever so severe that Kilian could not leave the house. Pallmer, in the meantime remained in the care of members of his parish until he succumbed on September 1, 1873, in the morning at eleven o’clock. Kilian, still confined to his home, could not even attend the funeral conducted by Pastor Proft of Fedor. Pastor Pallmer was buried next to his wife in the Serbin cemetery. The child associated with Mrs. Pallmer’s death was the Pallmer’s second child. Their first child, Johann Gerhard, had been born in Serbin on October 28, 1871. On his deathbed, Pastor Pallmer asked the teacher, Ernest Leubner, to look after two-year-old Gerhard. Leubner added Gerhard to his family and took Gerhard with him to Illinois when he became employed at the orphanage in Addison. While Leubner wrote that they adopted him, Martha Jahn, Gerhard’s daughter, said he was not adopted. Evidently Gerhard went as Gerhard Leubner until he began to study at the Teachers’ Seminary, when he changed the name to Pallmer. Weldon Mersiovsky, our tenacious and tireless Wendish researcher, set his sights on learning what became of the only Pallmer child and eventually located Richard Jahn in Chattanooga, Tennessee—Pastor Pallmer’s great-great grandson. He initially provided Mersiovsky with digital copies of the Pallmer and Leubner documents. After Mersiovsky had them all translated Jahn sent the originals to Mersiovsky and the Wendish Museum in Serbin for safekeeping. After graduating from the Teachers’ Seminary in Addison in 1892 Gerhard became a teacher in various Lutheran schools in the Midwest. His final parish was Ebenezer, the congregation his father initially served. Gerhard and his wife, Janna Meyer had five surviving children and one of the children, Martha, wrote the memoirs and mentioned the locations where he served. She married the Rev. Richard C. Jahn, and her memoirs, as well as other Pallmer and Leubner documents, were eventually entrusted to her grandson, Richard P. Jahn, Jr. The descendants of Johann Pallmer are aware of their Wendish heritage and several have visited the Serbin cemetery and the Wendish museum. In an earlier article titled “Prussian or Saxon” I attempted to show how the religious environments of Prussia and Saxony contributed to the creation of first St. Peter church in Serbin. While this first separatist group remained small, and the congregation was short-lived (1858 to 1867), a second St. Peter came into existence in 1870 that lasted for forty-four years. Even though most of the members of the first St. Peter’s congregation were also members of the second, pietism was not the divisive issue. The issue that split the second St Peter from the mother church was language: not Wendish vs. German, but Wendish/German vs. only German. Pastor Kilian preached in both German and Wendish and conducted services in both languages, but Article VI of St. Peter’s constitution explicitly stated that the only language to be used in divine services would be German. It is hard to imagine how language could lead to a division on something that could have been resolved through good will. The primary language of the mother church, subsequently named St. Paul, was Wendish and German was secondary, and for two years prior to the split, that minor inequity roiled the congregation in several ways. Those little events so set things on edge that the language issue hardened and could not be compromised. And it is ironic that as the new St. Peter congregation took shape, it became not a purely German congregation, but a bi-lingual congregation using both German and Wendish—the same languages used by the mother church—except the primary language was reversed. In 1855, as the Wends settled the Serbin area, they founded their own congregation just as they had done in Prussia. Creating a church at their expense, without state help, was therefore not a new experience in the Texas setting. The laymen took charge and assumed responsibility. This group was called the “inner congregation” and these men looked after the physical property and took care of church matters in general. Initially, membership in that group was open only to men who held property in the Delaplain League because their land purchases paid for the church lands staked out in the middle of the league. Later on, landowners outside of the league could become members if they paid an amount based on the size of their property. And eventually membership in the inner congregation required a $2.00 payment. The “outer congregation” was composed of all the members of the congregation including Germans, who were considered guests. The inner congregation made the decisions for resolving the problems as they arose, and that system existed for ten years—from 1855 to 1865. The meetings were conducted in Wendish and Pastor Kilian served as both chairman and secretary. In 1866, when the congregation was filing documents to join the Missouri Synod, some officials of the Synod found fault with the system of the inner congregation because poor people were potentially excluded. Synodical leaders preferred a voters’ assembly that was open to all male members. The Serbin congregation acquiesced. The voters elected a Wendish chairman and Vice-chairman and Pastor Kilian stepped aside and served only as the authority on religious matters. Some of the new voters were German who did not understand Wendish, so the meeting was conducted in German and the secretary, Gottfried Lehnigk, recorded the minutes in German. In addition to the practical complications with language there was also a philosophical context. That Wendish resentment toward German dominance, part of the age-old tension between the German and the Slav, crossed the Atlantic with the emigrants not only on the Ben Nevis but also with the Wends who migrated after the Civil War. German nationalism, however, also crossed the Atlantic and grew more vocal as German power in Europe grew during the 1860s and culminated with the unification of Germany in 1871. There were even some Wends who thought German was the language of the future and supported the use of the German language in Texas. On occasion a Wend married a German and Kilian considered that family as German. In 1868 the membership was divided between 493 Wends and 88 Germans. It was within this two-year framework (1868-1870) that people’s preferences became their convictions and the second division took place. It started with the congregation’s school. Initially Pastor Kilian also served as the parish schoolteacher and taught in both German and Wendish. As he aged and as the school grew in size his effectiveness as a teacher suffered. A few years earlier, in 1867, a Wend, Gottfried Lehnigk had helped teach for a time, and the parents were pleased with a full-time teacher. After Lehnigk returned to the North, the parents lobbied for a full time teacher instead of returning Kilian to the classroom. Kilian’s feelings were hurt but he did not oppose the voters’ decision to ask for a graduate from the synod’s teachers’ seminary in Addison, Illinois. Kilian’s son, Gerhard, attended the school, but he was a few years short of graduation and there was no other candidate who knew Wendish. Not only would the Addison graduate be called to teach, he would become the cantor, the organist, and leader of congregational singing “according to the local [Wendish] practice.” The candidate would begin by teaching school and at the same time he would learn how to play the organ and also learn Wendish and the Wendish way of singing. Kilian would teach the Wendish-speaking children three times a week. The director of Addison had a candidate, Ernest Leubner, a recent immigrant from Germany, twenty-one years of age, who had attended Addison for one year. Although qualified to teach, Leubner did not know Wendish and had studied piano for less than a year. Leubner was installed as the teacher on August 3, 1868, and under the tutelage of Kilian and Carl Teinert, the current church musician, began practicing the organ, learning Wendish, and familiarizing himself with the ways the Wends sang. Although he progressed with music, learning Wendish and Wendish ways proved difficult. The stage was set for a controversy that involved the congregation and the use of German and Wendish languages in church services—not just in the Voters’ Assembly. Should Leubner, who was called to be organist and cantor serve in those positions even if he was not competent, or should Carl Teinert, who had served as organist and cantor for years continue to do so even if he had not been called? The controversy became complicated and various proposals failed to find a resolution. Positions hardened and it became clear to the Wends that Wendish ways would suffer further erosion. Seeing no solution to the conflict, Kilian resigned his position on May 22, 1870. The Wendish group sent him a new call and he accepted, while the German group sent a call to John Pallmer in Baden, Missouri, which he accepted. In September the Wendish Voters’ Assembly banned the group that had called Pallmer from using the church and school, but consented to return the contributions of money and labor members of the Pallmer group had made to the church property. Pastor Kilian estimated that two-thirds, approximately 444, remained with St. Paul and that one-third, approximately 220 joined St. Peter. Kilian predicted that only a civil court could resolve the problem. But on September 20, 1870, the four lawyers, two from each side, drew a document acceptable to both sides. In return for relinquishing their claims against the property of St. Paul, St. Peter members received the fifty acres held by the 1st St. Peter as well as the congregation’s buildings, (but not the house built by John Schoenig), the old St. Paul organ, $628.23, and use of the cemetery. The documents, however, do not explain why the second St. Peters did not occupy the old church a mile away or build a new, larger church on the fifty acres. Instead the members of the second St. Peters establish their new home near St. Paul, opposite the cemetery. (The precise location has not been identified with a marker.) The initial expectation of the German group had been that the two congregations would share the new stone church, but the Wendish group did not agree. Somehow the two parties arrived at an understanding and St. Peter received a portion of the St. Paul church lands. The members of the 2nd St. Peter then dismantled the abandoned 1st St. Peter church and used the lumber to build a parsonage on the opposite side of the cemetery. The church would be completed a few months later and dedicated on April 26, 1871. Pastor Pallmer arrived before the parsonage was built, but it was quickly completed and used for his installation. St. Paul had refused permission to use their church for the occasion even though Kilian performed the installation on December 11, 1870. Both congregations were members of the Missouri Synod, and it was customary that the nearest pastor would administer the rite. Because the two groups had so much in common Kilian compared the division to the Biblical separation of Abraham and Lot. To avoid conflict Lot selected the lower lands and Abraham kept his flock in the highlands—but they served the same God. The analogy was not a perfect one because Lot’s and Abraham’s lands were separated while St. Paul’s and St. Peter’s parish boundaries coincided. And even though both congregations were members of the same synod, the close proximity required on-going delicate diplomacy. For the next forty-four years two churches, separated only by language, existed side-by-side. St. Paul eventually lost the struggle to preserve the Wendish language and used only German; St. Peter, the smaller, lost its reason to exist, and finally turned over its property to St. Paul. The section on Rev Johann Pallmer will be in the next edition of the Texas Wendish Society Newsletter coming out in January 2016. This blog wants to encourage you to tell us how your parents or grandparents felt about dancing. To start off this investigation, George Nielsen has offered up his first recollections about dancing. This article appeared in the April and July 2015 editions of the Newsletter of the Texas Wendish Heritage Society, Serbin, Texas. Because some of the Texas Wends originated from Prussia and some from Saxony a question could be asked if origins made a difference. Does political geography influence the way people think and act? If you were asked about your origins, would it make a difference if you said “United States” or if you said “Texas”? You would probably say “United States” if you were talking to someone in Singapore and “Texas” if you were in Denver. A “United States” answer glosses over traits that would be meaningless to someone in Singapore while the person in Denver would be aware that a Texan is not a New Yorker. The Wends were concentrated in three provinces: Brandenburg to the north with Cottbus as its center; the western tip of Silesia, with Hoyerswerda; and Saxony on the south with Bautzen as its center. Brandenburg joined Prussia in 1618 and in 1745 Prussia conquered Silesia. More borders changed after the Napoleonic wars so that at the time of Wendish migration the Wends were either in the kingdom of Prussia or the kingdom of Saxony. Because the Prussia king was Calvinist and his wife was Lutheran they did not participate in the same celebration of the Lord’s Supper. And in Potsdam, the residence of the royal dynasty, there were two garrison churches—one Calvinist and one Lutheran. In 1799, the year after he became king, Frederick William III called for a common liturgy for both Lutheran and Calvinist churches. The primary motivation for denominational change was not primarily religious, but it was part of the centralization of power needed to survive in the struggle with other European nations. Following the defeat of the Battle of Jena in 1806 the king assigned the administration of religious bodies to an agency of the royal government. In Saxony, even though the Saxon population was primarily Lutheran, the rulers of Saxony were Catholic, and had been since 1697. The king did not interfere with the Saxon State church, and instead a council, or a consistory, of clergymen administered church affairs. Theologians and not state officials made the decisions concerning the Saxon church. So while residents of Prussia and Saxony had much in common and shared the same denominations, their religious life was not identical and that in turn set the stage for two different experiences. Now, would those different experiences translate into thought and action? To understand the two different experiences it is necessary to review the Lutheran sacraments and then fit them into the two provinces. The Lutheran church subscribes to two sacraments: Baptism and Holy Communion. Both meet the three requirements for a sacrament: instituted by God, visible elements, and means of grace. While the two sacraments have so much in common, there are differences in the implementation. In the case of baptism the recipient can be anyone—from infant to aged. The visible element, water, may be applied through sprinkling, pouring, or immersion. The administration of baptism, although generally done by a pastor, can also be done by any layperson especially if the infant might not survive. Few theological debates have focused on baptism and a single baptism lasts a lifetime. Baptism was rarely an issue of debate so we will focus instead on the second sacrament. The Lord’s Supper follows a different protocol. Only an ordained clergyman administers the sacrament, the recipients must understand the teachings of the sacrament, and the participation is repeated throughout the believer’s life. And there are dire warnings about improper participation at its celebration. First there must be acknowledgement of sins committed, remorse for such acts, and gratitude for the forgiveness God grants. And while there may be no controversy concerning the visible element in Baptism there are conflicting views concerning the bread and wine in the Lord’s Supper. Luther taught what is called the Real Presence. The bread and wine are visible, but at the same time, in keeping with Christ’s assertion when he instituted the sacrament, so are his body and blood. Calvin, on the other hand taught that only the bread and wine were present, and that they symbolized Christ’s body and blood. Doing the Lord’s Supper right was important to a believer because—instead of forgiveness—a person who takes the sacrament improperly does not receive God’s grace, but God’s condemnation. Serious business. It was the Sacrament of Holy Communion that became an issue of contention for many Prussian citizens, Wend and German alike. It was in 1817 that the Prussian king, Frederick Wilhelm III decreed the creation of a single church that merged the two Protestant faiths—although participation was voluntary. Compliance was anemic and the king did little more than make the change at the garrison church in Potsdam where he worshipped. The king, while he was unwilling to force his decree, became personally involved in writing a new Agenda, or a communion liturgy, that would be acceptable to both faiths. The new Agenda appeared in 1821 but it created opposition, especially from Lutherans because the wording was vague so that neither side would find fault. In 1829 a revised version appeared and the next year, 1830, the king ordered both Lutheran and Calvinist faiths to adopt the name Evangelical and to use the new liturgy. Opposition mounted and the king backed off of on the Evangelical demand, but insisted that the Agenda would be used in all Protestant churches in Prussia. Resistance continued, however, and was strongest in the former province of Silesia and centered in the city of Breslau (now Wrocław, Poland). Congregations and pastors broke the law and in secret meetings continued using the Lutheran order of service. Police arrested and jailed pastors and officials fined parishioners for attending clandestine services. Those who resisted were called names such as fanatics but the most common was “Old Lutheran.” Emigration to other provinces was an early response for those who would not compromise and in 1838 the large migration of Old Lutherans from Prussia boarded ships for Australia and America. When Frederick William III died in 1840 opposition to the Evangelical (or United) Church became more public and the successor to the throne Frederick William IV adopted a more moderate policy. Even though he retained the Union church he permitted the Lutherans to form their own synod—the Breslau Synod. (1845) The Old Lutherans had their own pastors, their own churches (without steeples or bells) but they received no monetary support from the state. The easing of the restrictions did not halt emigration and in 1854 the Ben Nevis group left Europe, thirty-seven years after the king’s initial order and after Lutherans won the concession to use their own Lutheran liturgy. A Prussian Wend’s primary concern was the celebration of the Eucharist. It had to be administered by a clergyman and it had to be done with the specific, not vague, words of institution. A layman could not perform the sacrament and the Calvinist liturgy was unacceptable. That was the struggle of the Prussian Wend. Pastor Johann Kilian, even though he was a pastor in Saxony, served at Kotitz, a congregation that was near the Prussian border. Lutherans from Prussia visited his congregation and celebrated the Eucharist with his flock. He also crossed the border and visited those newly formed independent congregations that were associated with the Breslau Synod. The Prussian authorities learned of these activities and their diplomats complained to the Saxony diplomats and the Saxon authorities threatened to remove Kilian from his pulpit if he did not cease his meddling in Prussian affairs. Eventually, in 1848 he accepted a call from the Weigersdorf-Klitten parish and moved from Saxony to Prussia. He joined the Prussian Wends in their struggle and served as the pastor who administered the Lord’s Supper in the Lutheran way. When he joined the migration to Texas he and the Prussians Wends had a common experience as a result of this struggle. The Saxon religious setting differed significantly from that in Prussia. Even so, discontent was present in the Saxon church. It was not over the Lord’s Supper but over the growing influence of Rationalism in religious circles. Rationalism was the religious aspect of the Age of Reason. If the application of scientific thought was the way to improve human existence, then why not apply reason to religious life as well? Pastors toned down such teachings as the atoning work of Christ, miracles, or the concept of original sin, and instead preached about God’s benevolence and attempted to apply reasonable solutions to life’s problems. While the urban middle class generally accepted the rationalist mindset the peasant and laboring classes did not. So the Saxon Wends remained with the state church where they received the Eucharist the Lutheran way. Instead of building independent churches and drawing around a faithful pastor and orthodox services, they focused on personal piety and private emotional reassurance. Six persons signed the call document in May 1854 asking Johann Kilian to be their pastor. Four were Prussians and two were Saxons. Nothing in the document identifies their nationality and no details were given for the four-and-two division. At that time no one knew how many emigrants from either country would join the group. Five months later while the Ben Nevis was being decontaminated in Queenstown the Wends on the Inconstant elected five persons to serve on the Church Council—three were identified as Prussians and two as Saxons. By this time the leaders knew that roughly 300 emigrants were from Prussia and approximately 200 were from Saxony. This information indicates that the leaders were aware of nationality and suggests that they had a concept of representation. Although some minor cases of discontent surfaced on the remainder of the voyage, none was related to nationality and the creation of a church council proved to be an effective way of dealing with issues. The conciliatory pattern, however, was interrupted in the autumn of 1856, a year and a half after the purchase of the Delaplain League. Two men, one a Saxon and one a Prussian confronted Pastor Kilian after a church service for his failure to observe any days of repentance (Bußtage – BOOSE tah gay). The complaint surprised Kilian and there been had no previous indication of any discontent concerning this custom. The observances of the major church observances such as Christmas and Easter were fixed, but the various German provinces set their own procedures on the Bußtage. Prussians observed four days; Saxons observed two days. The congregational leaders resolved the problem and authorized Kilian to make the decision. Kilian set two services of repentance: the first Sunday in Lent and the Friday before Advent. Although the incident does not illustrate a Saxon-Prussian division in the congregation, it does show how the people tried to preserve the religious practices they held in Europe and those practices were not always identical. The next year, 1857, Kilian reported a controversy within the congregation over the use of conventicles or prayer meetings. One portion of the congregation supported the practice of meetings during the week and another opposed it. Although Kilian did not identify the proponents, it was a practice that the Saxons had used in response to rationalism. It was during this extended congregational discussion that the German Methodists at Grassyville, about four miles away, conducted a camp meeting and invited guests. The emotional elements of a camp meeting appealed to the pietism of the Saxons and some attended. One Wendish couple joined the Methodist congregation. Kilian admonished the congregation about attending the Methodist meetings and tried to accommodate the pietists by setting up prayer meetings every Wednesday and Friday evenings. He involved the lay people in prayers, but the enthusiasm generated by the Methodists could not be duplicated. Six months later, after Easter, 1858, Kilian ended his meetings. No other Wends joined the Methodists but some fraternization continued. Kilian called for a resolution of the issue and about five weeks later Kilian preached a sermon in which he called for an agreement, or separation, or his departure. The pietists responded with a letter in which they stated their decision to separate from the congregation because they did not believe they could compromise their views nor did they desire the departure of Kilian. Thirteen persons signed the letter—nine Saxons and four Prussians. In response the leaders of the main congregation sent a letter signed by five officers—four Prussians and one Saxon. So while the European experience may have been significant, other factors such as personal friendships and family ties prevented a clean-cut division along national lines. The new congregation named itself St. Peter and built a church about a mile away from the mother church. Kilian offered to baptize their children and invited them to bury their dead in the cemetery, but he refused to welcome them at the Lord’s Supper. St. Peter instead turned to clergymen from the Lutheran Texas Synod for the Lord’s Supper. The language in church was German although Wendish could be used in reading services or in family settings. The church did not grow and the congregation closed its doors in 1867. Although some St. Peter members returned to the mother church others moved to the West Yegua area that eventually became Fedor. Some Saxon Wends had moved to the West Yegua already in 1855 and traveled the twenty miles to Serbin for church. Then in 1870 twenty families formed a church and a Saxon Johann Proft became their pastor in 1871 and remained there until 1875. Although some Germans affiliated with the Fedor church, most were Saxon Wends. The irony is that the pietist Saxons in Texas faced the same issue the Prussians faced in Europe—the Lord’s Supper. Methodists were also Calvinists and the Lutheran Saxons in Texas had to choose between the Lutheran Lord’s Supper and the emotional fulfillment of the Methodists. Rather than becoming Calvinists the old Prussian response became the new Saxon one: the creation of new congregations. St. Peter failed, but Fedor survived. Time healed wounds and so did marriages, relocations, and other problems in proclaiming the Gospel. In Texas Saxon and Prussian needed each other to make the church work and piety became a personal decision rather than a congregational one. “Mr. Jacob Moerbe and his brothers-in-law, the Wuensches and the Dubes, have been leading members for years in the Fedor church being very well informed and pious people, who had daily prayers in their homes, attended every service, brought up their children in the nurture and admonition of the Lord, gave liberally from their goods for the support of church and school, and led an exemplary Christian life.” Ray Martens, Worthy of Double Honor: The Rev. G. Birkmann, DD (Austin: Concordia University Press, 2011), 333. Serbin’s official beginning took place in 1860 when the government honored the community’s request and gave the little village a post office. From 1860 on Serbin experienced a modest growth until 1890 when the railroad builders bypassed Serbin and then began its decline and lost its status symbol—the post office—in 1909. Texas was readmitted into the Union in 1870 and elected Republican leaders, but politics was often the cause for problems rather than a solution. The young Republican Party was northern party and Abraham Lincoln had won with Northern votes. The party leaders planned a national party by establishing it in the South as well. They envisioned a Republican Party based on the former Southern Whigs, immigrant Northerners who saw business opportunities in the South, and the Freedmen. The Democrats were not inclined to step aside and instead used methods, including violence, to regain political power. They elected a Democrat governor in 1873 and then wrote a new constitution in 1876. Bastrop County was one of only nineteen Texas counties (another was Fayette County), out of 122, to deliver a majority against secession. Locally, there were some strong leaders who were in favor of staying in the union, but there weren’t many. The main group who voted against secession were the Germans. The county-wide totals were 335 for and 352 against. The secessionists lost by 17 votes. The pro union voters had 51%. The Serbin area box, called Rabb’s Creek Box, cast 57 votes in the election, 56 against and 1 for. Without that box the vote would have been 336 (53%) for and 296 against. The other box that voted against secession was Bastrop, which had a sizable number of Germans, mostly merchants and tradesmen living in town. For example, in January 1866, Bastrop County commissioners designated thirteen roads that they would keep up–one of the main ones was the Bastrop to Brenham Road, via the Serbin Community. It closely followed the Gotier Trace. In the late 1860s, St. Paul’s congregation remained one of only five church buildings in Bastrop county. All the rest were in the town of Bastrop. This is an important factor in demonstrating how developed this area was. After the Civil War was a very difficult time in the South. The Emancipation Proclamation became effective in Texas when the Federal troops landed in Galveston in June 1865, as 5,000 soldiers enforced martial law. The Federal government made Texas an occupied territory (no longer a state). There was a great deal of difficulty for the freed slaves because the conservative whites tried everything they could to maintain as much of the status quo that they possibly could. Eventually the Federal government put into place the Freedman’s Bureau and there was an agent in Bastrop who had the authority to call in Federal soldiers. Most of the Germans felt the desire to help the emancipated slaves with their new found freedom and not resist the changes that were going on. I know that this was true in this area. Eventually most of the Federal troops were withdrawn, and the Texas government created a State Police force that was kind of like the Texas Rangers and under the control of the governor to help protect the African Americans, as the Army had done before. An example of what the Freedman’s Bureau did was to promote schools for African Americans. In the Serbin area, a man named Solomon Fehr donated land and timber for a schoolhouse where he himself taught students before being replaced by an African American teacher. What happened in the political realm was that the African Americans, and mostly German Americans, and a few Union supporters, people who had opposed the war, etc, were able to carry the day in the polls because a number of the Anglo whites were prohibited from voting and some of them opted out because they thought that the Federal government was going to make whatever it wanted happen and it did not matter if they voted or not. “Sir, Some weeks ago, while in the discharge of my official duties as justice of the peace, I was attacked by a band of outlaws, who had broken into our peaceable settlement, and severely wounded with a bowie knife by a certain Gorman, who with a number of men lives in the woods of this neighborhood committing depredations upon the quiet and peaceable German settlers of this vicinity. I appealed through Captain Porter [Freedman’s Bureau agent in Bastrop county] to General Reynolds [Commander of Texas for the military, ultimately in charge of everything about Texas] for protection and military assistance to arrest the offenders, but my petition was not noticed at headquarters. It may be proper to state here that it would be impracticable to summon a posse of citizens as the gang of desperados is too numerous to be caught at once and the remaining outlaws with their connections would certainly fall en masse upon every farmer who would obey such summons, when they find him alone in his field. It was therefore, that I most respectfully asked General Reynolds through Captain B. Porter, Sub Asst Commissioner of Bastrop County to send us a file of soldiers for the arrest of murderers and assassins. We have patiently been waiting for these troops, but in vain. Captain Porter informs us that he has not received a reply to the statement and petition sent by him to Headquarters and we have abandoned the hope that something will be done for our relief. In 1871, a gang terrorized northeastern Bastrop County, rendering the area “disorderly and deplorable.” Four men armed with shot guns and six-shooters disrupted a circus performing in Serbin. They drew down on Deputy Sheriff W. Miller and ordered him to leave, then turned on some freedmen, robbing them of pistols and money. Their leader, John Wilson, “well known as a desperado” and citizen of neighboring Burleson County, and another man named Long, boasted that they had recently shot a man named Paul Brice and stolen his horses. Arsonists acted near Serbin – burning another freedmen’s school, near Cunningham’s Post Office on the river. They also cruelly whipped the teacher. About the same time, in the Pin Oak neighborhood near Serbin “fifteen or twenty disguised men” took three elderly freedmen from their homes at midnight and “stripped and brutally whipped” them. Two of the freedmen, brothers Edward and Patrick Wormley rented land on Pin Oak Creek in far eastern Bastrop County, and the third freedman, Martin Bell, owned his place. The culprits whipped Bell “on the soles of his feet in the most inhuman manner” – so badly that an attending physician did not expect him to walk for a year. When the grand jury failed to indict anyone, there was a large outcry across the state and especially in Bastrop county and the governor nearly declared martial law in Bastrop County. Falling short of that, however, he ordered additional state policemen to the area. The local lieutenant appointed Fredrick Milton and August Jeffers as special police stationed at Serbin. Though a tentative Republican majority in Bastrop County provided some hope that freedmen could live there in relative safety, the political situation across Texas worked against them. In the January 1873 election, Republican Governor Davis lost to Democrat Richard Coke by a more than a two-to-one margin. Democrats also gained control of other executive offices and both houses of the legislature. This positioned the party, in 1874, to begin repealing the reforms carried out since 1869 and effectively ended the Reconstruction Era in Texas. The next year, after the Democrats regained control, a constitutional convention and the vote to affirm it erased much of the Republican policies and laws of a progressive nature. Once introduced in the 1874 session of the legislature, the bill had some difficulty making its way through both houses of the legislature but finally emerged with a consensus and the name “Lee County,” in honor of Confederate General Robert E. Lee. After the final vote in the House, the bill became law on May 2. Reconstruction should be associated with political parties. The Republican Party was young party that did not have a following in the South. In order to make it a national party it was necessary to bring in those Southerners who were former Whigs, add those Northerners who wanted to build up the South with railroads, factories, and enterprise, and add the Freedmen to provide the votes. The Conservatives were the Democrats who wanted to keep control of the state and prevent the Freedmen from voting Republican. (Low taxes, cotton economy.) Pease and Edmund J. Davis were the only Republican governors in those days. Examples of violence during the Reconstruction Era evidenced itself in the death and burial records of St Paul Lutheran church in Serbin. 1. Jordan Krueger, farmer on the Bullfrog [Creek], died at 7 pm on Sunday, 10 July 1870. He was murdered by his renter. Jordan is survived by one son, August, in California; one son, Henry, here; one daughter, Minna, in Hannover; and one daughter, Emma, in Pennsylvania. 2. On July 9, 1871, a year less a day from which his father was killed, Henry Krueger, farmer near the railroad station in Giddings, died from fatal injuries received from an unknown person. 3. Carl Wilhelm Herman Muenzenberger, (mentioned by Kesselus) who died 15 May 1872, was a former merchant in San Antonio, then teacher at the public school that was founded at Serbin on 1 Mar 1872. He was 39 years and one month old and was survived by a widow living in New Braunfels and one son. No cause of death was given. See also “Serbin in the News” in the Wendish Research Project blog. This article was initially a seminar paper written in 1959 for Mody C. Boatright’s seminar at the University of Texas. It was later published in Mody C. Boatright (ed.) et al. Singers and Storytellers (Dallas: Southern Methodist University Press, 1961), 244-259, and later an abridged version was printed in Francis Edward Abernethy (ed.) The Folklore of Texan Cultures (Austin: The Encino Press, 1974), 290-300. For more information on Wendish folklore read Mato Kosyk’s letter found in the Johann August Urban entry in WENDS WHO BROKE THE PATTERN in George’s Journal at Wendishresearch.org. See also George R. Nielsen, In Search of a Home: Nineteenth-Century Wendish Immigration (College Station: Texas A&M University Press, 1989), 119-124. Although these Wends came from Prussia and Saxony, they were not Germans, but descendants of the Veneti of ancient times and the Polab Slavs of the Middle Ages. They called themselves Serbes or Serben, but to avoid confusion with the Serbs of the Balkan region, anthropologists named them Serbo­ Lusatians or Wends. 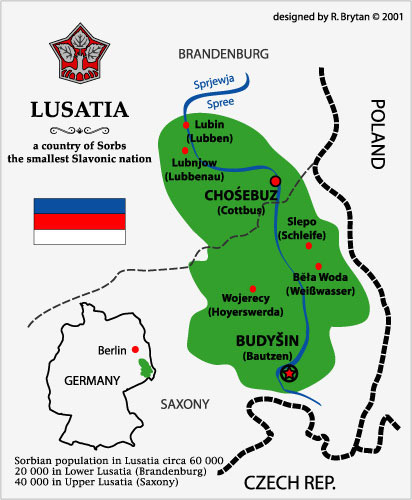 The most isolated part of the Lusatias, and thus the part that resisted Germanization longest, was the Spreewald, in Upper Lusatia, where the Spree River divides into hundreds of small streams, brooks, and marshes. Here the houses were built on islands, and flatboats furnished transportation during the warm months. The signboards gave the distances from one place to another not in kilometers, but in the time required for the pushing of the boat. In winter, when the canals froze, travel was by sled or skates. The occupation of the Wends here, as well as of those living outside the Spreewald, was mostly agriculture. They grew primarily vegetables and fruits, and in addition cared for domesticated animals and captured the eels which crowded the streams in the spawning season. The only trait that the Wends and Germans held in common was religion. They were either Lutheran or Roman Catholic. Most of the Wends were Lutheran, but they were not united with the German Lutherans, because the writings of the church had been translated into Wendish and the services were conducted in that language. However, when a parish needed a pastor, and there was a possibility that a portion of the congregation would accept a German clergyman, the government would immediately send a German-speaking pastor. By 1848 there were only thirty-six Wendish preachers left. Under these conditions it is not difficult to see why the Wends kept little European folklore. Much of their folklore had been associated with trees, animals, and land; so when they saw mesquite, scrub oak, and oleanders instead of birches, chestnuts, and alders, and coyotes, skunks, possums, armadillos, scorpions, and tarantulas instead of the few wolves, rodents, and deer of Europe, the stories must have lost their meaning. And how could one possibly imagine that spirits and fairies would exist in the same woods with, the wild Indians? Any costumes that were brought over were soon ruined by living’ under primitive conditions, and if there was money, it would be spent for land and not on new clothes. Ironically, the Wends did not escape from German influence. There were Germans in Texas when the Wends landed in Galveston, and in 1860 a large migration of Germans brought many to the vicinity of Bastrop County. In this instance the church was the unifying factor for the two groups and fraternization and intermarrying resulted. The question of language was the only real problem, but the pastor and the people were bilingual, knowing both Wendish and German. Services were conducted in both German and Wendish until the 1920’s, when German became the only language used in public worship.8 Folklore, as a result, is also a combination of the two cultures, and it is impossible to separate the German from the Wendish folklore. The most common and rich category of German-Wendish folklore is that of the folk cures. My first memories of these cures go back to my childhood when I stepped on a nail. In the hot summers of central Texas going barefooted was taken for granted, and along with the pleasure went the occasional injuries from grass burrs, mesquite thorns, and goatheads. A wound from a rusty nail, however, was a different matter, and in modern times the injured person would be punished further with tetanus shots. In the days when doctors were far away, and the transportation was slow, the remedies had to be applied at home. In this case the treatment was painless and effective. A piece of bacon rind was placed on the wound, and then the foot was set in a shallow pan containing turpentine. The combination of the two caused a drawing effect on the wound, and the strong odor of the turpentine had the desired psychological effect. This remedy was said to be good not only for wounds, but also for curing boils and chest colds. For curing the chest colds, strips of fatty bacon were sewn on a woolen cloth, saturated with turpentine, and then applied to the chest of the patient. The uncomfortable person had to sleep all night with the sticky, gooey, and evil-smelling poultice, but in the morning the cold was broken. Our skins suffered not only from the sharp spines of the thorns, but also from the sharp stingers of the yellow jackets and bees, and the painful bites of the big red ants. These were unavoidable. Sometimes we asked for it by standing on the anthill while holding our breath, or by knocking down the yellow jackets’ nest from underneath the eaves with fishing poles, but at other times we were innocently playing or picking cotton. If we were near my uncle, we would go to him for aid, and he would remove part of his chewing tobacco cud and place it on the bite. If we were closer to the house, we would run in to Mother who would then place a teaspoon of baking soda on the wound and pour on a little vinegar. It fizzed, and the cooling relief was felt immediately. In meines Jesu Garten Stehen drei baumelein Eins heist . . .
Das zweite heist . . . Das dritte heist . . . Blut halt stille. In my Jesus’ garden There are three trees One is called . . . The second is called . . . The third is called . . . Blood stop. The cure for warts requires a person to hold a silk thread over the wart and tie a knot in it. The thread is then buried next to the house where there is moisture. When the thread rots, the wart will be gone. When you ask the Grossmutter (Grandmother) if the cures are any good, she will smile and say, “Sie leben noch.” (“They are still living.”). The immigrants had to have some kind of variety in their life of hard work, and that variety was supplied by the church. Sunday service or any function of the church was time for worship and everything else. The customs observed at marriages and funerals shed a great deal of light on the life of the people. In the years immediately after the migration the marriage customs were almost identical with those used in Europe. Wedding celebrations usually lasted three days. Announcements and personal invitations were issued weeks in advance. The wedding party assembled at the bride’s home, and before they left for church, they would sing a hymn and say the Lord’s Prayer. The bride was dressed in a very tight-fitting black gown, which symbolized the sufferings of the new life ahead of her. (In the1890s gray was substituted for black, and after 1900 white was accepted.) Flowers were used generously on the carriages, the horses, the church, and the attendants. There were usually ten bridesmaids and ten groomsmen. After they had taken their places at the altar, the congregation sang a hymn, and the pastor preached a short sermon. The vows were then exchanged and the groomsmen laid money on the altar for the pastor and the organist. Erlangs du Reichtum wenn auch nicht halt. At the present time the weddings held among the people in the rural communities have changed somewhat. The celebration now lasts only one day, but the relatives who have moved out of the community return for a few days before the wedding. The weddings continue to be held in the church, but with much smaller parties. After the ceremony, the guests follow the wedding party to the bride’s house in automobiles. After greeting the parents of the bride and all the friends the guests gradually work their way to the woodshed where the beer is dispensed. Soon the coverings are removed from the tables and barbecue and all the accompanying dishes are served. Later in the evening, with the beer still flowing, dominoes, 42, and Schafskopf (sheepshead) are played. Occasionally the Hungry Five, consisting of a trumpet, baritone, clarinet, trombone, and snare drum, played some old German songs, such as “Gerade aus das Wirtshaus.” When the players get thirsty, they play “Bier Hier” and the bartender answers immediately with five schooners. Most of the guests leave between twelve and three in the morning, but some celebrate much later. Sometime after midnight the newly married couple will steal away and go to their home, or to some other home in the area. About half an hour later the young men will follow with plowshares, hammers, and any kind of metal that will produce vibrations. The “charivariers” approach the house quietly and suddenly begin the Katzenmusik (cat’s music). Sometimes they are invited in, but in most cases they give up and go back for more beer. The death of a person is signaled by the tolling of the church bell. It is rung for a minute, and after a brief pause, rung for another minute, followed by another pause, and then rung for a third minute. This practice symbolizes the Trinity. Then the age of the person is counted out with the bell strokes. The people in the community know who is ill, and from the number of bell strokes can usually guess who has died. At Serbin the burial usually took place the next day, in the afternoon. Sometimes, when the death occurred in the wee hours of the morning the burial took place the same day. The school children sing, and after the sermon the body is viewed. The procession to the Kirchhof (cemetery) is led by the pastor and teacher, who are followed by the pallbearers. At the grave another hymn is sung, led by the cantor. In Europe the folk place great confidence in the water dipped from a spring or stream on Easter morning. This idea also exists among the American Wends. One woman I knew would rise before sun-up on Easter morning, draw some water from the well, and make a small trail of water around the house. This would keep out insects the rest of the year. Another belief is that water dipped on Easter morning is healthful and that even though kept for some time it continues to taste good. A final major category of folklore is of dubious parentage. Many of the beliefs regarding planting and agricultural activity are also found among the English-speaking people, but since these sayings are widely accepted by the German-Wends, they should be included. It is generally believed that the moon has a powerful influence on the earth, for no one questions the moon’s control of the tides. It is logical, therefore, that its power would be felt in other areas than the tides. If both plants and humans, as the scientists tell us, consist of a large percentage of water, why should not the moon dictate to plants and man the courses they must take? 1. Anne Blasig, The Wends of Texas (San Antonio: Naylor Co., 1954), pp. 27-29. 2. George C. Engerrand, The So-Called Wends of Germany and Their Colonies in Texas and Australia (University of Texas Bulletin, No. 3417; Austin: University of Texas, 1934) , pp. 11, 22. 3. Ibid., pp. 14-17, 47-58. 5. Blasig, op. cit., pp. 17, 18. 6. Ibid., pp. 29, 30. 7. Interview with Mrs. E. F. Moerbe, Pottsville, Texas, November 2, 1958. 8. Blasig, op. cit., p. 82. 9. Interview with Mrs. Esther Gromatzky, Pottsville, Texas, November 2, 1958. 10. Interview with Martin Moerbe, Taylor, Texas, November 16, 1958. 12. Interview with Mrs. Eleanore Schneider, Austin, Texas, December 10, 1958; interview with Oswald Melde, Aleman, Texas, January 11, 1959. 13. Interview with Arthur Moebus, Serbin, Texas, October 18, 1958; interview with Mrs. Mitschke, Serbin, Texas, October 18, 1958. 14. Interview with Robert Malke, Serbin, Texas, October 18, 1958. 15. Interview with Oswald Melde. 16. Letter from Mrs. Wm. H. Nielsen, Vernon, Texas, December 2, 1958. 17. Interview with Oswald Melde. Mr. Melde did not know the names of the trees, but believed that no other names could be substituted. 18. Interview with Martin Moerbe. 19. Interview with Oswald Melde. 21. Interview with Arthur Moebus. 22. Blasig, op. cit., p. 59. 23. Interview with Oswald Melde. 24. Blasig, op. cit., pp. 54-56. 25. Interview with Oswald Melde. 27. Engerrand, op. cit., pp. 49-51. 28. Interview with Oswald Melde. 31. Interview with Arthur Moebus; interview with Robert Malke. 32. Interview with Otto Schneider, Austin, Texas, September 3, 1958. 33. Interview with Mrs. Arthur Melde, Aleman, Texas, January 11, 1959. 34. Interview with Otto Schneider. 35. Interview with Oswald Melde. Several people have raised the issue of using the black wedding gown as evidence for identifying Wends. I am cautious when it comes to fashion, and those who know me would say I am justified in doing so. However, I have consulted Trudla Malinkowa (Gertrud Mahling) and her comments make me feel more secure. The primary purpose of this list is to identify those individuals who came from a Wendish heritage. The secondary purpose is to specify the date of migration. If you can verify information on the following lists, notify me at gnie857317@rap.midco.net or 1132 Enchantment Rd. Rapid City, SD 57701. The 1910 census enumerator asked individuals to identify the country of their birth. Germany would have been the country for Wends, but for some people, the enumerator, Robert A. Falke identified them as “German/Wendish.” The assumption is that the individuals supplied the information and he entered it. Even so, there could be errors. Some individuals listed as “German” could be Wendish, and some listed as “German/Wendish” could be German. Some names I have always considered German are marked with an asterisk (*), so I would appreciate verification. The first number in each entry is the line number on the census. Following the name is the age of the person in 1910; www means the person and both the parents were Wendish, and ww means the parents were Wendish, but the person was born in Texas. The last date is the date of migration. Anything in brackets is added from other sources and an empty [ ] means the information is needed. Ben Nevis immigrants are omitted unless the information is helpful. Rosina Wukasch 87 (wd) www 1858?? The 1920 census also called for the place of birth but it added a request for the “mother tongue.” Ernst Kunze was the enumerator. 273. Anna Wacker 48 (wd) www 1876 husband was Wendish. The enumerator, Henry C. Brahm, listed the home village for some of the Wends. On occasion he wrote Windish instead of Wendish. Some people around Bethlehem, Pennsylvania are Windish, but that is a different ethnic group.